The European Commission has given the green light for the United Kingdom to pass its newest laws regarding horse racing betting operations. These include operations run by entities from outside the UK. It comes amid a desire to get some amendments working in the field to work properly. The UK (UK casinos here) will be imposing a new tax levy of 10 percent on all horse racing betting service providers that plan on working within the UK. The EC determined that the new tax levy does fit in with the general standards that the European Union uses for operations in general. 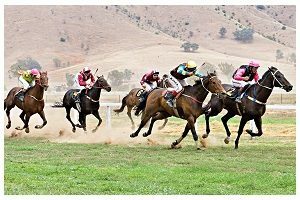 The general effort is being designed to make it easier for all people to participate in a variety of horse racing betting activities. Pool and spread betting activities will be included in the levy. All bookmakers at racing sites and betting exchanges will also be subjected to the new levy. The 10 percent rate is to be the same. Offshore companies had been allowed to contribute funds to the local market if they desire without having to deal with taxes. That is, such payments were completely voluntary. The new tax levy ensures that all offshore entities are to now work with basic tax payments. The new levy had been planned to be put in effort on April 1, 2017. It would work automatically for all entities aiming to do business in the country regardless of the parts of the world they are based out of. The general goal is to have them stay featured on the betting ledgers offered all around the UK. This move marks a significant change in terms of how business is to be carried out. It used to be that offshore companies that work with horse racing betting efforts did not have to contribute taxes. Meanwhile, those within the UK had to pay a 10 percent total on their Gross Gaming Yields or GGY totals. With the new change, all entities are to manage their GGYs regardless of where they are based out of. The general goal of the change is to allow the horse racing industry in the UK to grow and thrive. Part of this comes from maintaining proper fields for racing while getting funds for numerous high-end racing events to be provided. The goal will be to allow more activities to take place within the country. The levy is expected to be fully implemented within the next seven years. The UK Gambling Commission has also been expected to go forward with supporting the levy to ensure that the racing activities in the area can be promoted properly. This includes making the right decisions on getting funds ready and suitable for all sorts of events to be held in the future. The total funds that are to be raised by the levy in the UK are unclear at this moment as it is uncertain as to who is going to participate in this change. Still, it does make for a significant change in terms of making it easier for more transactions to work and to be visible to the public in general.